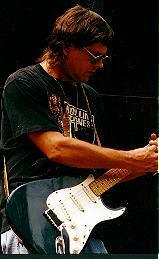 John Shepherd is one of those guitarist that makes his audience set up and say WOW after he plays. His music reflects his deep Delta Blues heritage and he plays it with style. John Shepherd and the Houserockers are one of the hottest Blues Bands in the delta. Writing and performing keeps John Shepherd busy. He has played his music from Beale Street to Riverfront Drive. John was a vital part of the Little Rock Blues scene for years. He was with the John Craig Blues Band and gigged at Jaunita's and other great blues spots.